So... Hungary held a referendum on this same issue (I believe they also offered pensions in 2004, I'm not sure if pensions are a part of this offer?) but the vote failed due to popular Hungarian apathy - low voter turnout. But, In 2004 Hungary and Slovakia were being accessed into the EU, the economy was still afloat, and things were, all in all, looking up. So why then in 2010 when the economy is in it's worst shape in a decade (i.e. IMF bailout of 2009) are they so enamored with providing citizenship now? I mean, I understand the historical pull of nationalism for Magyars, the seething anger towards the Treaty of Trianon, the political expediency of it, and the dissatisfaction with treatment of Hungarian minorities in Slovakia, Transylvania, and the Voijvodina, the advantages of passport diplomacy in weakening the states from which the minorities currently reside (i.e. Russia in Crimea)... but how, especially as unemployment remains high, is this economically advantageous for Hungary and Hungarians residing and working in Hungary? Why, other than campaign promises made by Fidesz, wouldn't they hold another referendum? Or, do the aforementioned reasons take precedent over the present state of the economy? Is there something simple I am missing? I would appreciate an objective, and not ethnically tinged, conversation from subsequents commenters. slovak language law affects only artifitial persons, did you know that ? if englishman has a traffic accident in scotland, and doctor speaks only scottish language to him and patient dies, is it ok for you ? If there is a law that every doctor in Britain must use english language if his patient speaks only english is that a violation of doctors minority rights ? If a policeman in scottland doesnt want to help you and he speacs scottish to you (and you speak only english) is it ok for you ? or if a clerk doesnt want to sale something to you because you are english and the shop is in wales ? 2. Why you lie aboute double citizenship ? There is no double citizenship allowed in Germany, Austria, Denmark, Czech rep. New slovak citizenship law is only a copy of czech citizenship law. If a slovak citizen goes to live to USA and he gets US citizenship he may keep slovak citizenship too, because there is an agreement between USA and slovakia. But slovak who lives only in slovakia has no right to get US citizenship, that would be absurd. Hungary wanted no negotiations, no agreement with slovakia aboute this topic, so this is the result. Are you trying to tell me its normal if slovak citizen still lives in slovakia and he gets hungarian citizenship, so he may vote twice to european parliament ? One hungarian party from slovakia and one from hungary ? Is it ok for you ? You seem to be a bit emotional about the subject. 1 - In the UK nobody will fine you if you speak only Gaelic. In fact, you can even become British citizen if you learn only the Welsh language while you cannot speak a word in English. You can be a policeman, doctor etc. in Wales if you speak Welsh. It might be disadvantageous, but nobody will officially discriminate you if you do not speak English, given you are fluent in another indigenous language. 2 - The reason why you cannot become US citizen while living in Slovakia, because the US does not want to grant this status on that base, and it has nothing to do with Slovakia. 3 - In general, I do not understand the fear and panic you have in Slovakia. If an ethnic Hungarian wants to be a Hungarian citizen, and Hungary wants to award it to that person, it is a love made in heaven. You cannot stop it. You cannot force people to become ethnic Slovakian, and to love the you / the nation / the country with poisonous laws. The whole idea of this damned EU is meant to be grounded in democracy, i.e. with other words: the freedom of choice. If Hungarian citizenship is what the ethnic Hungarians want let be it. Or your worry is that too many of your people would prefer Hungary to Slovakia? 3 - In general, I do not understand the fear and panic you have in Slovakia. If an ethnic Hungarian wants to be a Hungarian citizen, and Hungary wants to award it to that person, it is a love made in heaven. You cannot stop it. You cannot force people to become ethnic Slovakian, and to love the country with poisonous laws. The whole idea of this damned EU is meant to be grounded in democracy, i.e. with other words: the freedom of choice. If Hungarian citizenship is what the ethnic Hungarians want let be it. Or your worry is that too many of your people would prefer Hungary to Slovakia? I am a H citizen living in Budapest and have a lot of H and SK friends in SK. I never felt tension with them as the people I know do not really buy the nationalist-populist crap of the current government. To be honest it did not feel good when Slota (2nd man in SK gov.) was talking in public about raiding Budapest with tanks. For me Slota is playing on SK people's minority complex to gain votes and to make some pocket money (pretty successful). Come on Slovaks! You have strong economy, pretty good hockey team; why do you still feel inferior to us? Now we have populist government in H (I am not happy), but I feel that SK politics is also partly responsible for this. In H we say now eat what you cooked! Problem is I have to eat also what stupid nationalists cooked (on both sides)! Let us try to get civilised! I read with interest the article posted on your blog titled “Slovakia Hungary/Pandora’s passport”, not only because I am a Hungarian specialist, but also because Mr. Adam LeBor dealt with the same subject recently in the Guardian, in his article, "Hungary’s passport law is a diversion”. The subject is undeniably controversial for outside observers, particularly if they do not pay sufficient attention to the complicated historical context of the Hungarian parliament's recent decision to adopt the legislation under discussion. The losses that the Kingdom of Hungary suffered after the First World War as a result of the Treaty of Trianon, which of course you wrote about, cannot only be calculated in terms of square kilometers lost. Of course population losses -- if one can put it like this -- were also of enormous significance. Of the greatest significance, however, was what impact the Treaty of Trianon had on the historical and cultural thinking of the Hungarian political elites, as well as its citizens. It was an enormous civilizational shock for the Hungarians, which in Europe has not been discussed much, since it was perceived as a consequence of Hungary's place on the losing side. As a result, it was not taken into account that revisionist tendencies usually appear in countries that have been "severely" punished after losing wars. Presented to the country in more or less successful ways, these tendencies incline its people to agree to risky solutions -- one such example is Germany. Of course in Hungary, for many reasons, these kinds of radical views appeared with less strength, but which nevertheless did lead the country to conclude risky alliances, which can be seen in the example of Hungary's participation in the Second World War. The passing of the legislation on dual citizenship is an expression of Hungarians' admission that earlier attempts at rebuilding an ethnic (national) community of Hungarians failed, not only in its intention, but also in its consequences. Because however the problem is alive, since Hungarians are still living beyond Hungary's borders, the current government wants to rebuild this community on the foundation of a shared language and culture. Even at first glance one can see that this is an undeniably difficult task, but one that shows that the authors of this legislation were thinking in terms of the future -- even if the legislation might have been more precisely formulated, which you allude to delicately in your article. To Szczepan : In year 1918 (in this year was 1st czechoslovak republic established and aknowledged from almost all states) lived in hungary 630.000 slovakians - check it out, source : Conférence de la paix 1919-1920. Recueil des actes de la conférence. Partie IV. Oh dear ! 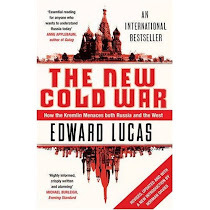 This is, of course, deeply embarrassing to Mr Lucas' whose deeply paranoid and propagandistic thesis of 'The New Cold War' in which only Russia is playing on ethnic nationalism is undermined somewhat.If this is what politics in Hungary-Slovakia is like, imagine Georgia and the Caucasus ! "Reform" minded states like Georgia have Bumpy Rides on their Inexorable March to Natopia, including vicious ethnic nationalism, reigning down grad missiles on civilians in Tskhanvali in South Ossetia and then blaming Russia by progecting Saakashvili's aggression onto a heinous plot by Russia to dismember Georgia when it reacted. Naturally, in accordance with the Orwellian doublethink that is the hallmark of Lucas' writing, when Hungary and Slovakia start ethnic nationalist stirring it's "curious". Never to to with the failure of neoliberal policies and a populist-nationalist backlash. Again if Russia gives passports out to South Ossetian's, Lucas parrots the line of Brzezinski that it's 1938 and Hitler's technique of dismembering Czechoslovakia. When Romania tries the same in Moldova and resucitates Antonsecu its omitted and unmentionable. As only Russia is essentially Evil and Sinister. Not least after it rejected being ruled by a bunch of rapacious oligarchs who took advantage of the Young Reformers shock therapy reforms to sell on oil and gas assets by buying them cheap and selling them high. That Hungary is offering passports to ethnic Hungarians in Slovakia is just glided over as a funny old pointless spat. The idea that Greater Romanian nationalists have done the same in Moldova is a fact that is conveniently omitted. As is the fact that the heroic and thrusting democrats of the Twitter Revolution of April 2009 like Oleg Brega were part of the same network of visceral anti-semitic far-right wing nationalists who call themselves "Liberal Democrats" so that those like Lucas will peddle their cause to advance US geostrategical aims against Russia.